Total Revenue and expenses reported in 2017 were $63.6 million. Total revenue increased by $5.2 million when compared with 2016, demonstrating CIP’s continuous success in securing Windows 3 and Bilateral, while stabilizing Windows 1 and 2 revenue sources. 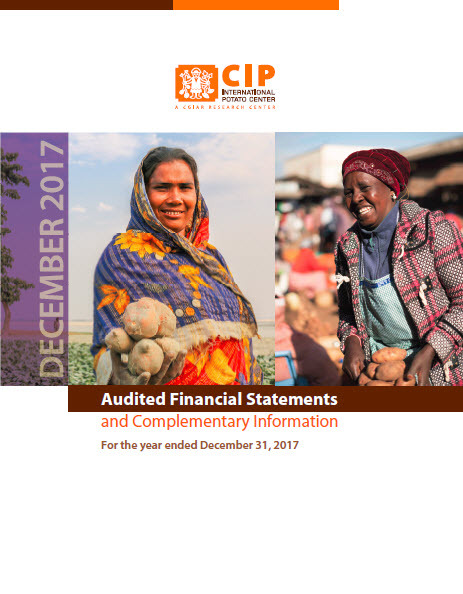 The long-term financial stability indicator, which measures the number of days of unrestricted net assets that can be used to cover CIP’s forward planned operations, is 86 days (within the CGIAR recommended norms). CIP’s overall financial position continues to be sound and the Center did not need to use any credit facility during the year. CIP’s financial indicators reflect the Center’s continued financial health, though no institution is immune to financial or operational risk. To mitigate risk, the Board’s Audit Committee ensures oversight of CIP’s risk management policies and plans. In a much broader sense, the Board oversees Center operations in the interest of donors and stakeholders.